The field of geomicrobiology explores the interactions between microbial and geochemical processes. 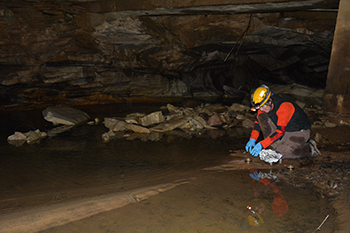 Annette Engel conducts interdisciplinary research that includes cave and karst aquifer evolution and speleogenesis, the role of natural organic matter in karst, geochemical controls on microbial metabolism, oil degradation and trajectories following environmental disturbances, the biodiversity of cave systems and coastal marine habitats, and symbiotic associations between bacteria and clams, invertebrates, and alligators. Her research falls broadly within the discipline of geomicrobiology, the study of the interactions between microorganisms and their geological and geochemical surroundings. Research involves a range of classical inorganic and organic geochemistry, stable isotope geochemistry, and molecular genetics methods within a microbial systems biology approach. Much of the instrumentation is available in Dr. Engel's laboratory. To quantify inorganic and organic compounds in water and gases, she applies basic wet and dry chemistry methods, ion chromatography, UV-Vis and fluorescence spectroscopy, Fourier transform infrared spectroscopy, gas chromatography, gas chromatography-mass spectrometry, and inductively coupled plasma mass spectrometry. She also uses X-ray diffraction and X-ray absorption spectroscopy using synchrotron radiation to understand mineralogical and elemental composition of natural materials. She uses stable isotope geochemistry, specifically of carbon, nitrogen, and sulfur, to characterize microbial signatures in water and sediment. For systems biology, she applies genomics and bioinformatics approaches that include DNA amplification protocols for PCR and quantitative PCR, and different gene sequencing methods, including next-generation high-throughput 454 and Illumina platform sequencing technologies to obtain DNA-based gene sequences and metagenomes ("who is there?") and also RNA-based transcriptomes ("what are they doing?") from environmental samples. To investigate metabolic potential directly from a sample, she routinely uses classical culturing methods and enzymatic assays. She also examines samples microscopically using gene probes for a full-cycle approach, where she can obtain genetic information and then probe material with specially designed probes to target specific microbes." Terry Hazen's lab is a diverse group of scientific post doctoral fellows, research associates, technicians, and students in microbial ecology and environmental engineering. 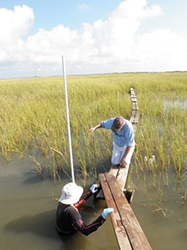 The primary research emphasis of the lab is basic and applied field microbial ecology, especially as it relates to bioremediation, biofuels, enhanced oil recovery, and water quality. The overarching vision for the lab is understanding the fundamental concepts of systems biology and environmental stress response pathways from the molecular to the ecosystem level to improve our knowledge of fundamental biogeochemistry and suggest exciting new applications that are relevant to the world's current problems. 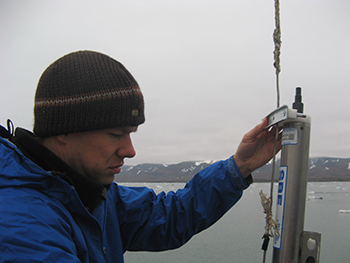 We have labs at both UT and Oak Ridge National Lab and active field studies in Puerto Rico, Alaska, Gulf of Mexico and Oak Ridge. Whereas stromatolite microfabrics reflect a combination of microbial community growth, decomposition and lithification, stromatolite morphology appears to reflect primarily physical depositional factors, such as water depth, wave energy, and sediment influx. As a result, stromatolitic laminae, which record both microscale and macroscale growth processes, are arguably the most fundamental aspect of stromatolite morphology. Each lamina represents the active growth surface of the mat at the time of deposition and the geometry of successive laminae produces a record of microbial mat growth over time. Detailed analysis of stromatolitic laminae can therefore help decipher the growth of enigmatic stromatolitic forms, such as conophyton and jacutophyton. Microbialites comprise the mineralized record of early life on Earth and preserve a spectrum of fabrics that reflect complex physical, chemical, and biological interactions. In ongoing research, we are investigating mineralized microbial structures in Laguna Negra, a high-altitude (>3500 m) Andean lake in Catamarca Province, Argentina. Extreme environmental conditions restrict multicellular life so that mineralization reflects a combination of local hydrologic conditions, lake geochemistry, and microbial activity. The resulting carbonate microtextures are strikingly similar to those observed in Proterozoic stromatolites, and thus provide critical insight into microbial activity and mineralization in ancient environments. Precambrian microbial mats can be exquisitely preserved in early diagenetic chert, yet many of our most fundamental geobiological questions regarding the diversity of organisms and metabolic processes in these ancient environments remain poorly constrained. This dichotomy in understanding stems from both the relatively simple morphologies represented by many microbial populations and the inability of traditional optical microscopy to provide information on the chemistry of preserved organic matter, which together severely limits taxonomic determination and resulting physiological inferences. Microbial mats within early diagenetic chert record of distinct benthic communities that are preserved across a full range of taponomic states, permitting detailed analysis of mat growth, decomposition, and preservation. A 4‰ positive shift in the carbon isotopic composition of the oceans is recorded globally in marine carbonate rocks at approximately 1.25 Ga, may be related to an increase in the oxygenation of the Earth's biosphere. This 'event' marks a threshold in the mid-Mesoproterozoic that may be recorded in the geologic record by the diversification of microbial and algal life, as well as by the appearance of the oldest laterally extensive, bedded marine sulfate evaporites. Ongoing research has used the petrographic analysis of gypsum and calcitized sulfate phases, isotopic (particularly S and Sr isotopes) and trace element chemistry of gypsum and carbonate-associated sulfate (CAS), and geochemical modeling to explore the sulfate content of ancient oceans as a proxy for Earth surface oxygenation. Andrew Steen's research focuses on better understanding the function, environmental controls, and geochemical effects of enzymes in aquatic environments. Many key geochemical processes – especially oxidation of organic carbon to CO2 – are performed by environmental microorganisms. All life relies on enzymes to catalyze chemical processes, so the precise way that microbial enzymes work can have major effects on geochemical cycles.